Traditional Furniture brings a sense of royalty at home. The designs, the shades and the make is durable enough to have the units lasting for years to come. Of all the features, the one particular feature of Aarsun Woods furniture that sets the units apart is that the units are Handmade. Aarsun Woods brings to you Handcrafted Wooden Almirah made in premium quality Teak Wood with classic traditional style carvings all over the surface. The wardrobe consists of 3 evenly spaced out Panel Doors with fine designs carved out in front. Even the sides, the frame and the top has been carved out in floral and trendy designs that sets the unit apart from the regular wardrobes. 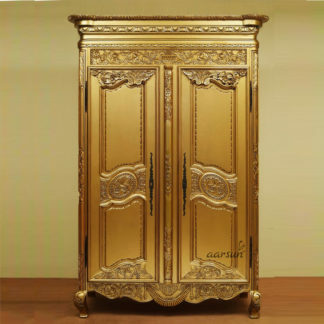 The top has a beautiful Arch carved out in traditional floral carvings that gives the unit a vintage touch. The design looks fantastic and so is the texture and shade of the unit. As this is a made to order unit, the design, the material used and the shade can be changed as per need.